Those that know me will be aware of my love of the richness of the English language, with all its descriptive ability and idiosyncrasies. With its roots in Latin, Greek, Anglo-Saxon, French, German, Polynesian and many others, it is still continually evolving (not ‘constantly’ evolving – the misuse that irritates me most, as constant means ‘unchanging’!). Yet there are many inconsistencies – look at the three words rough, cough and plough. All end in the same four letters, yet are pronounced in three different ways. That pronunciation of spoken English will of course vary even more with local dialects and upbringing. This variation continues into the naming of birds. All animals have a scientific name, usually based on Greek or Latin, describing its genus, species, and sometimes sub-species. Generally accepted practice puts these scientific names in print in italics. It is the common names that vary so much and may cause confusion. 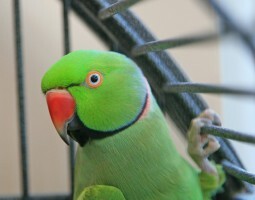 For instance, there is Pyrrhura griseipectus, the Grey-breasted Parakeet, although most British aviculturists refer to it as the Grey-breasted Conure, along with its cousins the Maroon-bellied and Green-cheeked Conures. 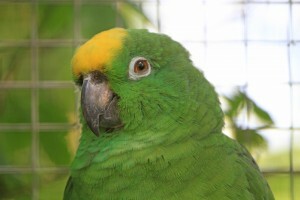 While in its native Brazil, it is Periquito Cara-suja in Portuguese. Then of course, we spell ‘parrot’ with the double ‘r’, while ‘parakeet’ usually has just one. Some names indicate the person mostly credited with the bird’s discovery and description – the Rothschild’s Mynah – while others suggest its geographical origin – the Bali Mynah. Most common names are more descriptive of the bird’s appearance, but we have the Ring-necked Parakeet and the Collared Dove, both with similar neck markings. Then there are Amazon Parrots with yellow in their names – Yellow fronted, crowned, faced, cheeked, headed, naped, or double-yellow headed. 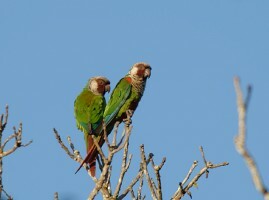 Some are different species, while others are sub-species of Amazona ochrocephala. The specific name here means ‘yellow-headed’, from the Greek words for pale yellow and head. In other birds the variation ‘xanthos’ meaning blond in Greek is used – e.g. xanthopteryx meaning ‘yellow feathered’. Avian taxonomy therefore causes much confusion, and those working in this field are generally classified into ‘Lumpers’ – who tend to group similar-looking birds into one species, with perhaps different geographical races - and ‘Splitters’, who prefer to divide birds with subtle differences into separate species or sub-species. Modern Techniques of DNA analysis are making the true classification of birds so much more accurate, with some big surprises thrown up. 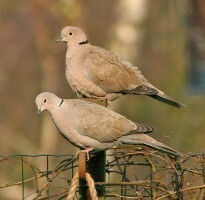 As a final example, there is the family Columbidae containing over 300 species of common bird, some of which are called pigeons while others are doves. There seems to be no consistency about which is which, and the two names are often interchangeable. I could continue and fill the whole page with more examples, but I think you get my drift. Fascinating, but potentially confusing! Older articles on this website and in our magazines, and older text books, will include older versions of scientific names of parrots. Newer names have arisen as a result of such things as DNA analysis proving or disproving relationships, as well as a gradual logical overhaul of the system.